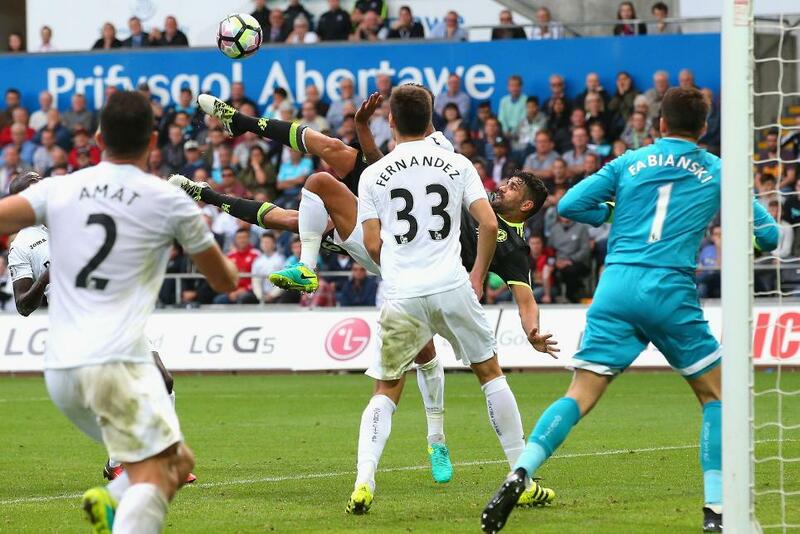 Diego Costa's superb overhead kick with only nine minutes to go rescued a point for Chelsea as they drew with Swansea City in a thrilling match at the Liberty Stadium. Chelsea dominated the opening period and took the lead on 18 minutes when Costa fired into the bottom corner when Swansea failed to clear their lines. Gylfi Sigurdsson, who had Swansea's best chance of the first half with a shot that just drifted wide, equalised on 59 minutes from the penalty spot after he was fouled by goalkeeper Thibaut Courtois following a smart Swansea counterattack. The hosts then took the lead three minutes later when Blues defender Gary Cahill was caught in possession and Leroy Fer's shot just crossed the line off the legs of Courtois. But it was Chelsea who had the final say and as the ball dropped from the sky after Branislav Ivanovic's shot was blocked, Costa rose to acrobatically score and to maintain his side's unbeaten start to the season.